April 17, 2019: Mired in a prolonged slump, Marlins center fielder Lewis Brinson is getting at least a couple of days out of the starting lineup to help him regroup. Manager Don Mattingly noted pregame that Brinson could be out of the starting lineup for more than a day or two. In 18 games, Brinson’s slash line is .197/.246/.262 (12-for-61) with 20 strikeouts and two walks. In his last seven games, he is 1-for-21. The Marlins showed tremendous patience with Brinson in 2018, his first full season in the big leagues. Then a rookie, he finished with a .199 batting average, with 11 homers and 42 RBIs. There is no disputing Brinson’s pure talent. And the outfielder is expected to be part of the young core for the future. As he gets a couple of days to get back on track, the Marlins have Brinson doing some tracking drills as well. Unlike a year ago, it doesn’t appear Brinson has as long a leash in terms of not showing signs of improvement. So it is certainly possible he could find himself optioned to Triple-A New Orleans if his struggles continue. “Last year, pretty long leash as far as letting him grow, getting the experience and continue to develop,” Mattingly said. Brinson's mom, Susie, urged Lewis to keep his options open and not just settle on the University of Miami, which is close to their Coral Gables, Florida home. Lewis graduated from Coral Gables (Florida) High School in 2012 with a 3.3 grade point average. He also hit .394 with four doubles, four triples, four home runs, 21 RBIs and 11 stolen bases as a senior for Coral Springs. Lewis was a Marlins fan growing up. Brinson says, "Juan Pierre was always my favorite player and continues to be my favorite player — his speed and his leadoff mentality of just getting on base and making things happen for the team. He really took heart in making things happen and scoring runs for his team, and that's what I try to do." The only thing bigger than Brinson’s love for baseball is his relationship with his mother. Susie Brinson first got her son into baseball when he was 4 years old, signing him up for Little League. They have always been close, and they have relied on each other more since Brinson’s father, Lewis Jr., died of lung cancer just after Lewis III turned 11. In 2012, Brinson got drafted by the Rangers (see below). Lewis excelled for the Arizona Rookie League-champion Rangers from the leadoff position all summer. He topped the league in runs (54), doubles (22), extra-base hits (36), total bases (124)—as well as strikeouts (74)—while showing off extreme athleticism. 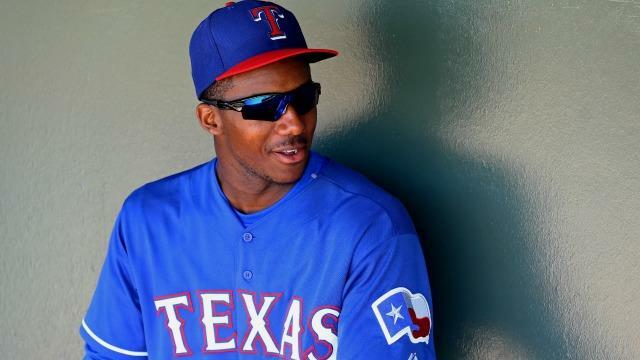 In 2013, the Baseball America Prospect Handbook rated Brinson as the 12th-best prospect in the Rangers organization. He was at #15 in the winter before 2014 spring training, and #14 in the spring of 2015. He was moved up to #2 early in 2016, behind only power-hitter Joey Gallo in the Rangers organization. After the Brewers acquired Lewis in 2016, he was rated as the #1 prospect in their farm system in both 2017 and 2018. Lewis is intelligent and works hard. He has very good makeup. He has that fire and he wants to be a really good player. Brinson says, "I don't like being babied in anything. You throw me into the fire and I'll find a way to fend for myself." When Lewis got the phone call on June 10, 2017, that the Brewers wanted him in the Majors, he was taking a nap at the apartment in Colorado Springs he had only recently shared with fellow prospects Josh Hader and Brett Phillips. "My Triple-A manager, Rick Sweet, called me and told me to pack my bags, I was going to the big leagues," Brinson said after the Brewers lost 11-1 to the D-backs at Chase Field in his debut. "I thought I was dreaming for a second. Obviously I wasn't, and I just started packing my stuff. Brinson had a whirlwind travel day. He arrived in the middle of a June 10 3-2 loss. And as a member of the active roster, he immediately pulled on his uniform and headed to the bench. Brewers manager Craig Counsell didn't waste any time putting Brinson in the starting lineup. When Brinson arrived at the ballpark June 11, he was listed at the leadoff spot, playing left field. "I wanted to find a spot for him today. That's what I like to do," Counsell said. "I think it's important to do that, and it's best for the player to do that. So it fit well for us today." In 2017, Brinson represented the Brewers in the All-Star Futures game. In 2017, Brinson was named the Brewers minor league player of the year. Dec 6, 2018: In November 2018, the Marlins debuted new team colors, moving toward a teal and pinkish-red scheme that evokes images of Miami's vibrant nightlife. Of course, they revealed new logos and uniforms to reflect those changes, leaving everyone in need of some wardrobe updates. June 2012: The Rangers chose Brinson in the first round, out of Coral Springs High School in Coral Springs, FL. Scout Frankie Thon signed Lewis for $1.6 million. August 1, 2016: Jonathan Lucroy was acquired by the Rangers, along with reliever Jeremy Jeffress from Milwaukee; with Texas sending Brinson, pitcher Luis Ortiz, and a player to be named later. January 25, 2018: The Brewers sent Brinson, SS Isan Diaz, OF Monte Harrison, and RHP Jordan Yamamoto to the Marlins; acquiring OF Christian Yelich. Brinson, who is tall, lanky and athletic, reminds some of Dexter Fowler or Cameron Maybin. Lewis has very good bat speed and can spray line drives gap-to-gap. There's leverage in his swing with good raw power, which could develop into above-average pop in the future. He should mature into a 18-25 homer per year guy. "I try not to be a pull hitter all the time," Lewis said. Instead he mostly lines the ball up the middle. Lewis has a 55 grade on his hit tool, and a 60 for his plus power, on the 20-80 scouting scale. Lewis showed maturation as a hitter in 2017 by improving his plate discipline (.400 on-base percentage), with a better walk rate than the previous season and a lower strikeout rate. Part of that maturation was learning to lay off breaking balls off the plate and continuing to use the entire field, an improvement that began the previous year. The sound coming off Lewis' bat is that special sound the great hitters have. "I want to be one of the best players in the game when I get to the big leagues — the Mike Trouts, Andrew McCutchens, Adam Joneses." Brinson said in 2015. "Stealing bases, throwing people out, taking away runs, hitting home runs and hitting for average — I want to be that all-around guy, and that's what I'm working on now." Brinson is learning to keep his hands back and shortened his stride to keep some of the loop out of his swing, in 2013 spring training. His more compact swing allows him to make contact more often off of a higher level of pitching. By the 2015 season, Lewis had scrapped the weird, squatting stance he had settled on late in 2013, returned to a more conventional setup that allowed him to utilize his athleticism and strength. He cut down the leg kick in his swing and sharpened his discipline at the plate. Lewis could develop into a Cameron Maybin-type player. Brinson swings and misses too many pitches. He strikes out entirely too much. (In 2013, he struck out 38 percent of the time he came to the plate.) But he's matured as a hitter since then. By 2015, Lewis had developed as a hitter, especially against breaking pitches. He made huge strides with both mechanical and approach at the plate adjustments, and in 2016, it paid off. He now recognizes breaking balls, and can hit them, now. "The more I see, the more I get used to it and the more I can recognize it," Brinson said in 2015. "When it's up I take a big swing at it and I can hit it now. Before, maybe two years ago, I wasn't so confident. Even if it was a strike, I didn't feel like I could do anything with it. Now, the past two years, maturing as a hitter and seeing more breaking pitches, I feel like I can do more damage against them." Just before 2014 Spring Training, Baseball America's Ben Badler said about Brinson: "You can put a bunch of 60s on his scouting report, with plus bat speed, raw power, excellent athleticism, great wheels and a strong arm with much improved defense in center field. He’s just so, so raw at the plate, so I’m definitely the low man on him at Baseball America. It’s an awkward, off-balance swing with a lot of holes, a pull approach and poor pitch recognition. If he were one or two small adjustments away, I’d be higher on him, but we’re talking about some pretty significant overhauls that have to happen for him to make contact at an adequate level. I can’t ignore the physical gifts, but I worry he’s a modern day version of Reggie Abercrombie." In 2015, Lewis arrived at spring training with a renewed belief that he is on the right path to the Major Leagues. Brinson showed improvement in Hickory before a July promotion to High Class A Myrtle Beach, where he scuffled, and battled through some nagging leg injuries during the 2014 season. Brinson is a tool shed, but he's still learning the basics of hitting. His bat speed and raw power are plus, but tapping into that in games remains a struggle. He has improved his plate coverage on the outer half and used the opposite field with more frequency, but that remains a focal point for him. So is making sure he doesn't expand the strike zone, especially against sliders. 2015 Season: Brinson had a major breakout season (.330/.402/.602 across high Class A, Double-A and Triple-A). Along with premium defensive skills in CF, he looks like he could be a star. Lewis's great 2015 came from a combination of physical and mental adjustments. Adding strength to his lower half helped him improve his balance with a stronger base. That helped him keep his head locked in, which allowed him to track pitches better. In 2015, Brinson found an approach at the plate, and for the first time as a pro stuck to it for a full season. The result was a reduction in his strikeout rate to 21.5 percent. 2016 Season: Lewis punishes fastballs enough to project as at least an average hitter with average power. He needs to do a better job of recognizing and laying off difficult-to-hit breaking balls, a skill he improved upon in 2015 before regressing in 2016. He’s a streaky hitter who didn’t have as many hot streaks in 2016 as he had in 2015, but Brinson’s struggles stemmed in part from injuries. Brinson tweaked one of his shoulders making a diving catch and even when he returned to the lineup, the injury seems to continued to slow him down. 2017 Season: Key to Brinson’s continuing maturation as a player is improved discipline at the plate and in the field. He walked more and struck out less this season than in any previous primary assignment. Jan 4, 2019: Joe Frisaro, Marlins beat reporter for MLB answered fan question on Brinson: Is this a make-or-break season for Lewis Brinson? Make or break may be too harsh, but I'd certainly say this is a season the Marlins want to see results from Brinson. The 24-year-old center fielder was given every opportunity at the big league level in 2018, and we know he had his struggles -- finishing with a slash line of .199/.240/.338 with 11 home runs and 42 RBIs. He also dealt with some injuries, but he showed promising signs in the second half. In his final 25 games after the All-Star break, Brinson hit .239/.263/.337. Beyond the basic numbers, Brinson did greatly improve the quality of his at-bats down the stretch. But to become an everyday, impact player, Brinson must improve against offspeed pitches. According to Statcast™, he hit .242 against all fastballs last year but just .143 off breaking pitches. Brinson was second on the team in home runs per at-bat, hitting a home run in approximately every 34 official at-bats. J.T. Realmuto was first, hitting one per every 22. As of the start of the 2019 season, Lewis's career Major League stats were: .189 batting average, 81 hits, 13 home runs with 45 RBI in 429 at-bats. "I take pride in my defense and my arm, and having instincts," Brinson said. "I think that's probably my strength." Brinson has a strong right arm for use in right field. But he provides outstanding defense in center field. He is a 55 defender, above avg. on the 20-80 scouting scale. And he has a 60 grade arm. Brinson shines in centerfield, where he has plus speed, range and arm strength, with much improved jumps off the bat. He works on his routes and throwing accuracy. "I always loved playing defense and making outs, making diving catches, robbing home runs and throwing people out," Brinson said in 2015. "I still get a rush from that. I take a lot of pride in that. Obviously, the hitting has come along and the power's there, and it's going to get better as I mature. I do take pride in being an all-around guy and helping the team in multiple ways. Lewis has very good speed that plays well on both sides of the ball. Brinson is a threat to steal a base. He is a 60 grade runner. July 30-August 6, 2013: Brinson was on the D.L. May 3-June 8, 2014: Lewis was on the D.L. with a strained quad, which slowed him down. April 27-June 4, 2015: Brinson battled nagging hamstring problems while running the bases and missed a month of play. June -July 5, 2016: Lewis was on the DL with a shoulder injury. August 15-23, 2016: Brinson was on the DL. April 4-13, 2017: Lewis dislocated his pinky finger sliding into second base the first game of the season and was on the DL for just over a week. August 15, 2017: Lewis's Minor League season ended. Brinson was expected to miss 4-6 weeks with a left hamstring strain. July 4-Sept. 1, 2018: Lewis was on the DL with right hip inflammation.